stippling is basically "stabbing" the bristles at the area. TCR has a thicker consistancy to normal paint and doe's start to congeal (like real blood) quite quickly. once you have done stage 1 wait about 30-40 seconds for the TCR to start to get tacky then go over it agin with you stipple brush to give it some texture. give the blood 5 mins to dry off or you'll just take most of the red off :? 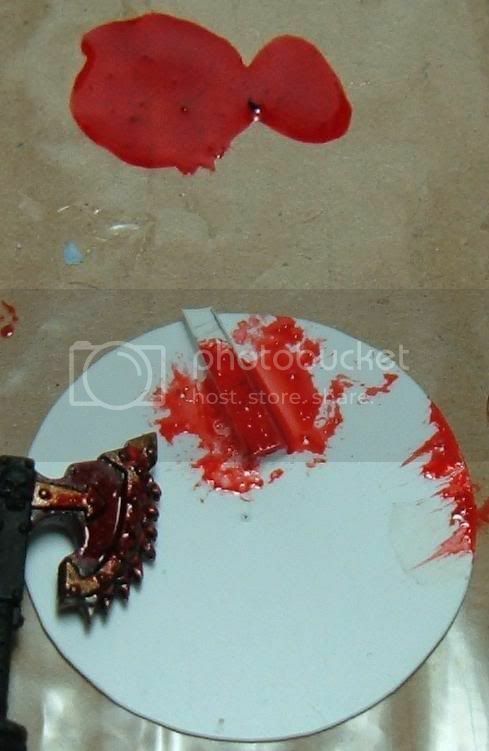 You'll have to experiment untill you get this colour, you want a nice dark red gore colour. Here's the Dark red 1st application. 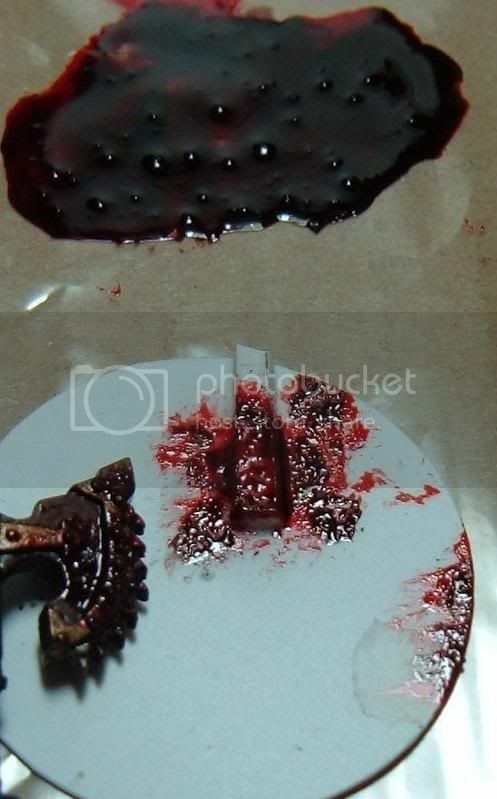 Here's the end result with the dark red re-stippled for texture. Well there you go really simple and i think VERY effective. Edited by The Angelus Sanctus, 13 July 2009 - 01:17 PM. 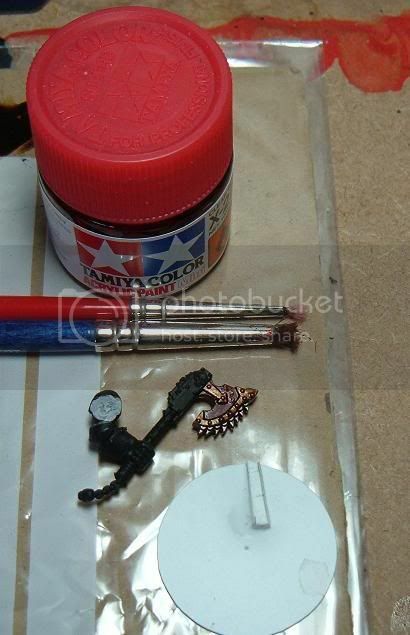 is tamiya paint availabe in generic hobby stores (hobby lobby etc), or do you have to order it? "92% of facts like these are made up, if you're one of the 8% that have real facts in your signature, copy and paste this into your signature so you won't be"
Tamiya paints are generally available in most hobby stores that i've seen. What black are you using with the clear red? An excellent tutorial! The look and texture alone is so life-like it's uncanny! can you drop us folks who have never used tamiya clears a few tips on working with them. i've heard they can be quite difficcult, and caustic to paint already on the model? This is why Daddy has to drink to relax, boys! well Tamiya clears are listed as acrylics but i wouldnt use any new brushes with them unless your cleaning with thinners. saying that it cleans off with water with my stipple brushes. Edited by L0NEW0LF, 26 February 2008 - 10:27 PM. oh my god, just tried this tutorial and am gobsmacked at the results...i am so glad i decided to do this - THANK YOU LONEWOLF!! i also tried adding super-tiny chuncks of really tiny rocks, and it looks great with your tutorial, becuase of the stipple : it looks like lil bits o' gore! 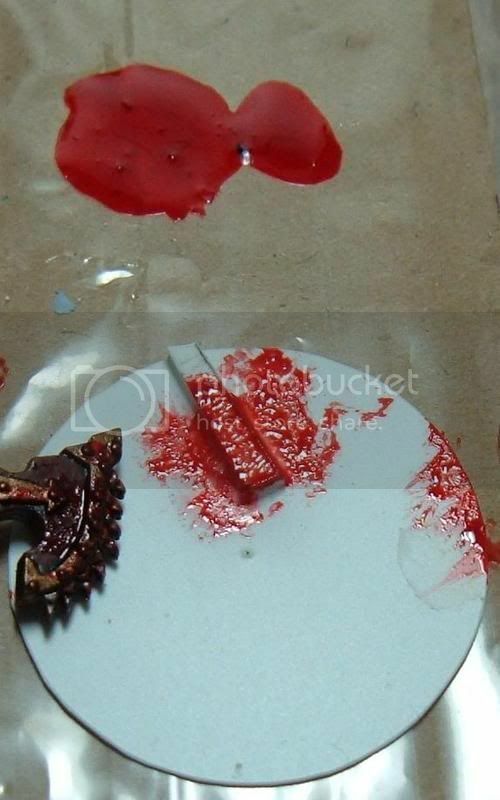 Do you think smaller blood spatters could be applied easily, by using a toothbrush? Or is the consistency wrong? can't be sure but i think the pure TCR would be a bit thick to flick. but saying that adding a tiny bit of water might thin it enough to do it. As in a mix of the two colours, one or the other, or some green and some yellow in different places? evne mix the 2 with a bit of brown ink aswell. I've seen your work before and I hunted down Tamiya Red Clear as well as their Green and Yellow and I plan on using your technique some on the Diseased Sons. I bookmarked this tutorial, maybe Nihm can use it in his mega thread. Bug him about inclusion. 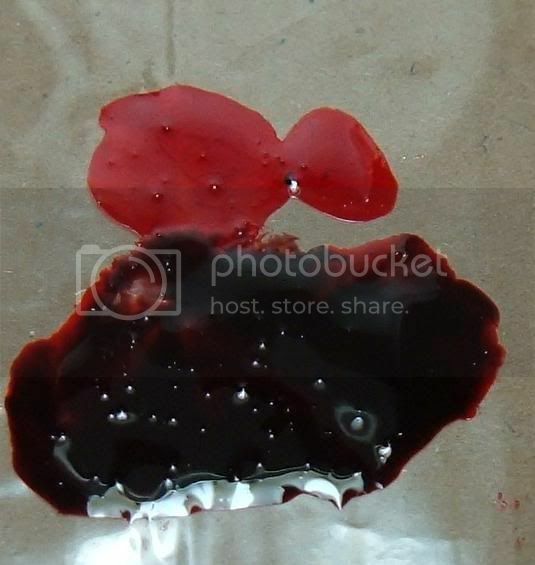 Fantastic blood, it's totally gross. If there is someone who wants an alternative that can look really gross too, or maybe just to review for hints, GW actually has something on their website under the Ogre Kingdoms. The link is here. While I think Lonewolf's painting is much better, there is some usefulness in reviewing the OK versions. Gor example, their recommendation to use a mix of static grass as well as small bits of stone makes for a really prime texture. Combined with Lonewolf's method, you'll have totally awesome gore. Plus, well, Ogres. Good place for gore inspiration... that one butcher with a mask made from chunks of tattooed human flesh was fairly inspiring. But yeah, karma for Lonewolf, I'm looking forward to the opportunity to try your technique. I've always thought to myself, "Good lord, this model is wielding a chainsaw, shouldn't s/he be totally covered in blood, gristle and guts?" I think it'd be especially... poignant? is that the word? for your Sisters Repentia, for example, to be all clad in white and holy-looking (assuming you paint them with clothes on) - with totally revulsive amounts of O+ sprayed and gooped on them. Wow...that is one thing I've struggled with, and its that easy. Thanks a million for that, I now can get mt BT's weapons a bit dirty. Edited by mitchell93, 25 April 2008 - 08:40 PM. eldar are like well..... cartman, from south park. He hates you for being you, but if he needs your help hes your friend. You, yes you; go read this now! It ought to be available in hobby shops in 'ol Blighty, seeing how the Tamiya Model Magazine we get in North America is written and printed in the U.K.
Dictate the Emperor's Will with ordnance. 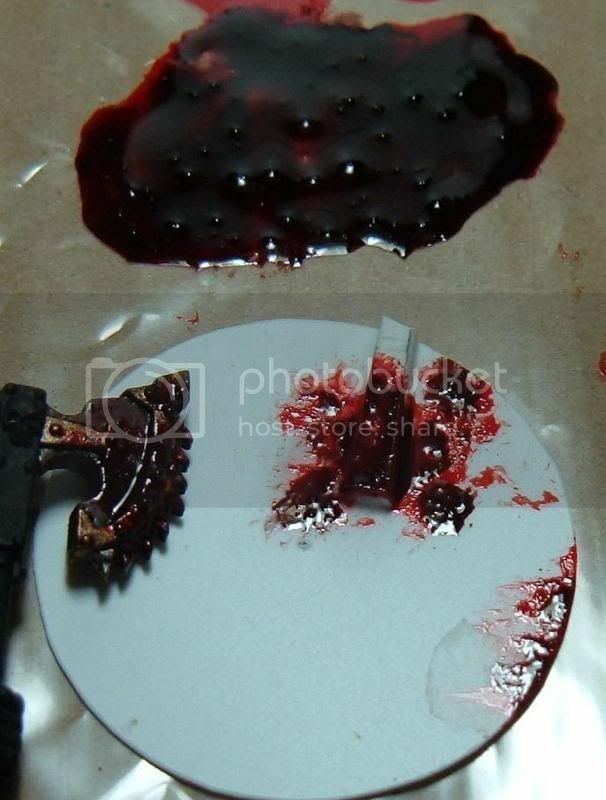 I think the first technique looks like someone's just crapped blood all over the gutplate, the second is better but I don't get why the gore would be coming from the bottom right of the plate only, the third is by far the best of the four and actually looks like gore splatter (though TCR is always going to work better for blood than Blood Red paint) and the fourth one is by far the worst: It looks like someone has just painted a load of dirt bright red and stuck it on the gutplate. Oh wait, they have! I guess the sand sort of gives the effect of coagulation but the static grass just makes it look like dirt and the colour is just wrong. 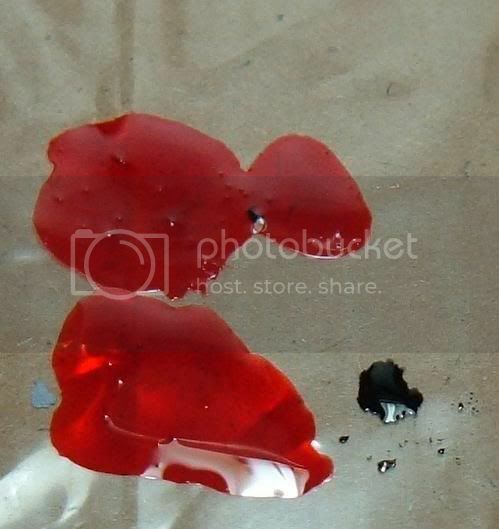 Yes, blood is reasonably bright when it comes out but nowhere near that bright and it darkens with coagulation anyway so it should be almost brown in colour. This article has now been immortalised in the Librarium. So if in the future you can't find it here, you'll be able to look for it in the Librarium.